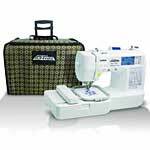 This is a video from HSN demonstrating the Brother HE-240 Sewing and Embroidery machine with USB port. The HE-240 is a private label that Brother made exclusively for HSN. It’s identical to the SE400 except perhaps for some accessories and bonuses HSN includes. Don’t be put off by the price in the video. You can get the SE400 for more than $130 less at Amazon. If you want the bonuses, than buy the HE240 from HSN. But be sure to check the prices sold separately. HSN also offers a monthly payment plan which may be worth it to you. Otherwise your best buy is the Brother SE400 from Amazon. Click here to read my detailed review of the Brother SE400. With the bobbin do you need to change each color your using for your thread, in embroidering a design? I’m new to all this. I haven’t sewn much since I was in middle school. Thats been a very very long time ago Thats a little bit of sewing here and there throughout the years. When they taught Home Economics classes. Back in the day they taught us how to sew and how to cook. Back then when we were sewing your bobbin thread was the same color as the thread you were using on your project. I am new to the SE-400. When I attempt to transfer an embroidery pattern from my computer to the machine the # of KB show up but no picture of the pattern. What am I doing wrong? I need your help. I have just purchased the Brother SE-400. I cannot figure out how to change the cm to inches. I also cannot for the life of me understand how to increase the font when I change the layout from portrait to landscape. If I put the size to L or M I receive a message that the size is too large for my size of frame. Also, I have been playing around with the feature of downloading images from my computer. The instructional video says a window will pop up on my screen once the USB cable is plugged into my machine. That does not happen. What am I doing wrong? 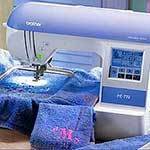 I just got my brother 400se, when I embroider, only my white bobbin thread sews onto the fabric. None of my top colored thread even is sewn onto my fabric. What did I do wrong? I had the same thing happen. Check the threading then check the threading of the bobbin. I found I had to put some effort into making sure the bobbin was threaded correctly so the bobbin tension was correct. You may need to loosen up the top tension and slightly tighten the bobbin tension. I bought the se400 embroidery machine. I’ve tried a few embroidery designs but twice it has jammed and the upper thread gets wrapped around the bobbin. I’m using the bobbin thread on the bobbin and the embroidery thread on the spool holder and using stabilizer I’m not sure what I’m doing wrong? Hi Kamala! I have to say your website is most helpful! I’ve just gotten a Brother SE400 and am a complete rookie- still trying to understand what I need, particularly with regard to software. I got the machine from a points catalog at work, so no retailer to help me out. There seem to be so many options and I’m afraid to purchase for fear that something may not be compatible. 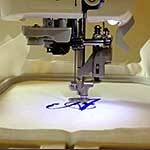 My main goal is to simply embroider monograms and lettering, though I may venture into letter appliques as well. I the machine and included hoop/accessories, thread adn some tear away stabilizer, but am stuck on the software. I know I’ll likely purchase fonts or alphabets (not sure exactly the difference yet) to be able to do single inititials as well as the traditional 3-letter monograms (with circles, diamond pattern or swirly with smaller outside letters). I know I need to be able to merge and size, particularly if the letters are individual files. For monogramming, with potential for later expansion, is there an inexpensive ~$100 ish software you recommend? I’ve seen a couple out there, but am unclear if they will all work with the brother. It seems somet things are proprietary and may not. I’ve also ordered an adapter to (hopefully) be able to save files from my computer to a flash drive and use the adapter with the USB cord to get it to the machine, rather than carry the machine to my desktop computer. I’m also baffled by the quanitity of fonts/alphabets out there-some free, cheap or expensive – any guidance as to what to look for in a quality piece, or is it a “you get what you pa for” situation? Sorry for the rambling questions – I’m excited to get started, but don’t want to waste money buying software/fonts until I really understand what I need for my particular goal- monogramming. Thanks a ton for all of the information so far!! All the third-party software (not from another machine manufacturer) I’ve heard of will work with the SE400. The software runs on your computer and must be able to save an embroidery file in a .pes format and support a 4×4 inch frame size. This is a very common format. Brother of course has their own software. I don’t know much about it because I have the impression (could be wrong) that it’s expensive. I use Embrilliance because it runs on my Mac (also on PC). Many people like Embird. The basic software will do what you want and they have add-on modules for more advanced features later. It might be a bit more than you want to spend. http://www.secretsof.com has Embird for about 10% less than Embird.com so look there too. People also like SewWhatPro, but I’m not sure of its expansion potential. All of those will work with the SE400 and have free trials, so you can try them first and make sure it doesn’t what you want. I don’t think the adapter will work because the SE400 can’t copy the files from the flash drive. The SE400 looks like an external drive to the computer, and the computer’s system software does the copying. But I would love to be wrong about this. So please let me know if you get it to work. It’s difficult to judge the quality of a design without trying it. I think there are a lot of cheap designs out there that might not give you the quality you want. But then for some projects might be OK. I’m not sure it’s always true that the price goes along with the quality. Some designers just seem to charge more. I usually try for a middle range that I’m happy with. Letters in particular are difficult because there are so many styles to choose from. I generally just find one I like and look to see if the designer has free designs. Most good designers offer free designs as a sample of their work. If not and I really like the design, I might just risk it if it’s not too expensive. Or just buy one letter in a set to try. Then I stitch it out to see on some test fabric before investing a lot of money. I always test a new design first before risking it on a project. Hope this helps, Good luck and I’m so glad you find the site useful.